Travelers flock to Sedona, Arizona, for the city’s impressive red sandstone formations, which seem to glow when illuminated at sunrise and sunset. Sedona is about 120 miles north of Phoenix, attracting a mix of local and international travelers. Hiking, spiritual treks, mountain biking, and landscape photography are a few of the popular activities in the region. You’ll find a wide range of dining options and a number of spas where you can schedule a relaxing massage. Rising 70 feet from the top of a 1,000-foot red rock cliff, the Chapel of the Holy Cross is one of the more iconic sights in Sedona. Designed by Marguerite Brunswig Staude, a student of Frank Lloyd Wright, the chapel was completed in 1956. If you’re driving to the chapel yourself, the road curves up and around, giving you pretty close parking rather than parking down in the lower parking lot and walking all the way up the steep hill. Slide Rock State Park earned its name from the natural water slide in Oak Creek. The park is in Oak Creek Canyon, a few miles north of Sedona itself. The scenic spot draws a number of visitors who want to slide down the rock or just wade in the various pools. Slide Rock State Park is often included in round-ups of the best swimming holes in the United States. Once you see it for yourself, you’ll understand why! While you can drive around and marvel at the red rock formations, most agree you should visit Red Rock State Park, especially for the view of Cathedral Rock. There’s a visitor center, picnic area, and you can even cool off in Oak Creek. 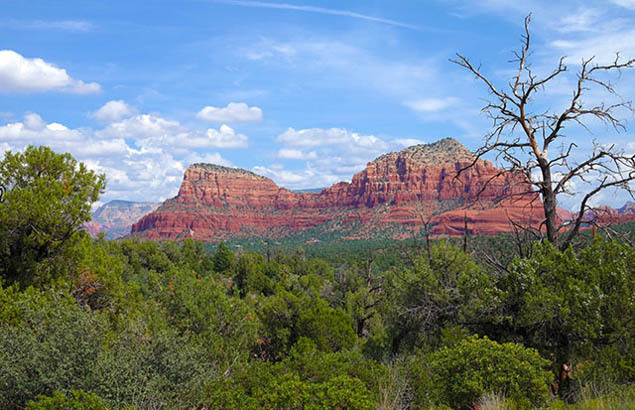 If you’re curious about Sedona’s spiritual side, consider booking a spiritual tour. These will include a stop at one or more of Sedona’s spiritual vortexes. Each of the vortexes are said to emit different types of energy so you can learn which vortex you should be visiting. Tours that feature the practices of Ayurveda, yoga, Reiki, and Chakra are a few of the other spiritual tour options as well. Arts and crafts are a big part of Sedona’s local culture. Located at the intersection of routes 179 and 89A, Tlaquepaque Arts and Crafts Village is an outdoor shopping center designed like a traditional Mexican village. You’ll find a variety of interesting shops and galleries. The Verde Valley is located near Sedona and is home to a number of wineries. The mix of dry climate and water access makes the area conducive to wine production. The Verde Valley Wine Trail will take you past four of the area’s most well known wineries. If you’re touring the Verde Valley wine region, make time to check out Montezuma Castle and Tuzigoot. Tuzigoot National Monument is a multi-story pueblo ruin situated on a limestone and sandstone summit. Montezuma Castle is a well-known national monument that includes cliff dwelling ruins. If you’re interested in learning more about Sedona’s history, allot some time for the Sedona Heritage Museum. The museum’s focus is on the people who pioneered Sedona, dating back to 1876. Even if you’re not a fan of McDonald’s food, it’s interesting to drive by and see the McDonald’s in Sedona. You won’t find the standard "golden arches" here. They are turquoise. Sedona has strict rules on the local scenery, and the iconic yellow of the arches would clash with the red sand stone. Another difference you’ll see in the Sedona McDonald’s, the sign is low to the ground – another local rule in Sedona. Have you been to Sedona? What else would you add to this list? Don’t miss any of our travel posts - sign up for our special email notices!